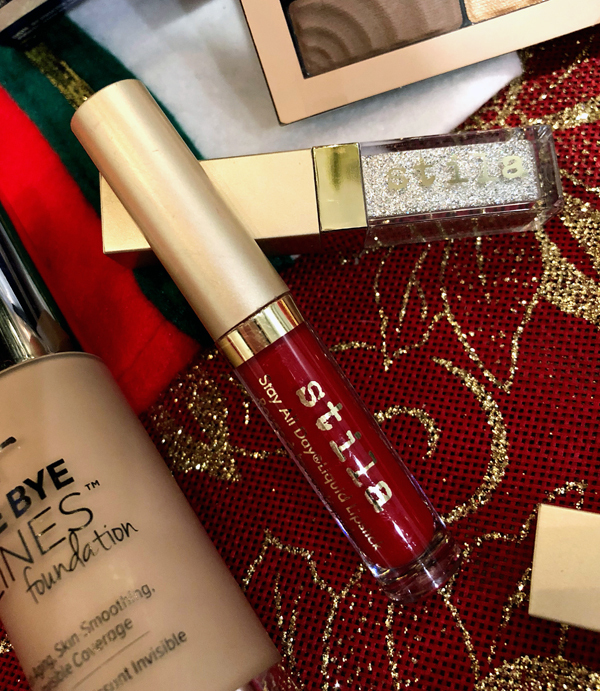 ‘Tis the season to wear red lipstick and add a hint of sparkle! 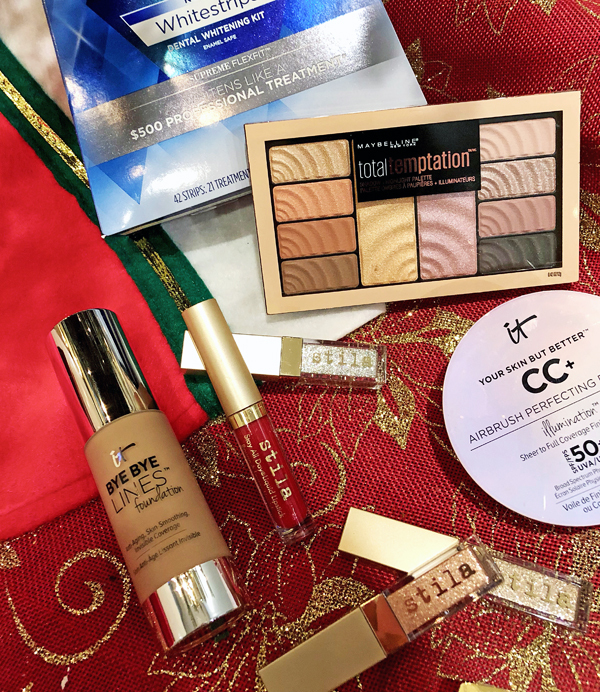 From Stila’s holiday liquid lipsticks and liquid eye shadow to Crest Whitestrips, Maybelline’s new Total Temptation palette, and It Cosmetics Bye Bye Lines Foundation & CC+ Airbrush Perfecting Powder, you’ll be set for picture-perfect holiday photos. 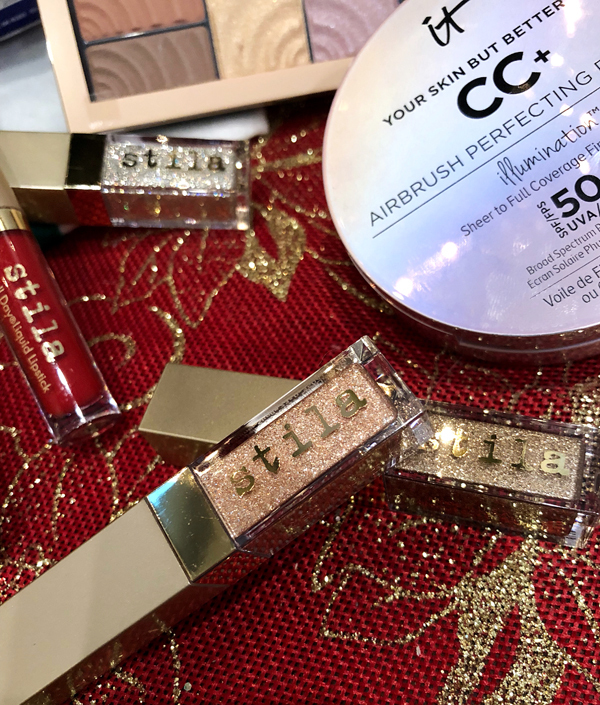 Stila Written In the Stars Glitter & Glow Liquid Eye Shadow Set – There’s sure to be a twinkle in your eye when you use this liquid eye shadow set.The shadows are the perfect mix of pearl and glitter, creating an incredible sequin-like shine that doesn’t smudge or leave your face a glittery mess. Crest Whitestrips -Perfecting the holiday red lip pout? Don’t let tarnished teeth ruin the look! 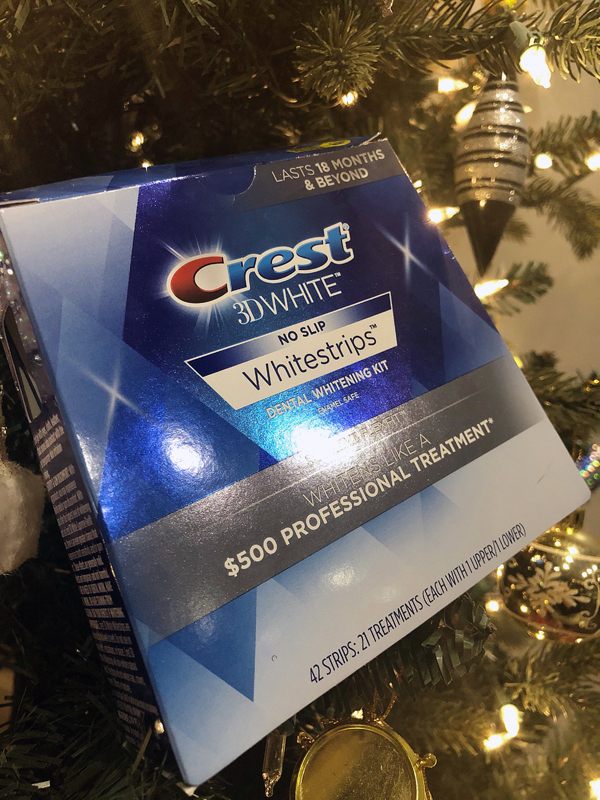 Crest 3D White Whitestrips Professional Effects remove 14 years of teeth stains for a brilliantly whiter smile .Their no slip grip means the strips stay put until you take them off, allowing you to talk and even drink champagne while whitening your teeth. Cheers to that! 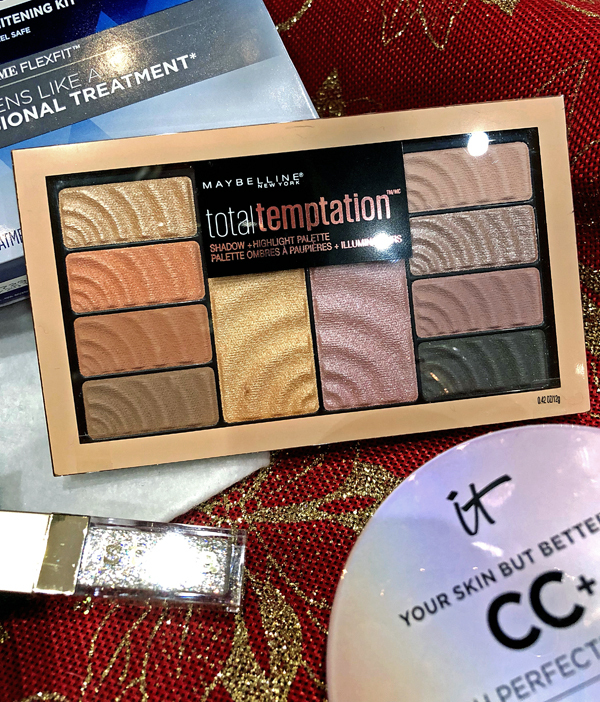 Maybelline Total Temptation Eyeshadow + Highlight Palette -This shadow + highlight palette gives you big bang for your bucks. Unlike a lot of lower price-point palettes, these pigments don’t require heavy layers to illuminate and they don’t crease after long wear, making them perfect to take you from office to holiday party. 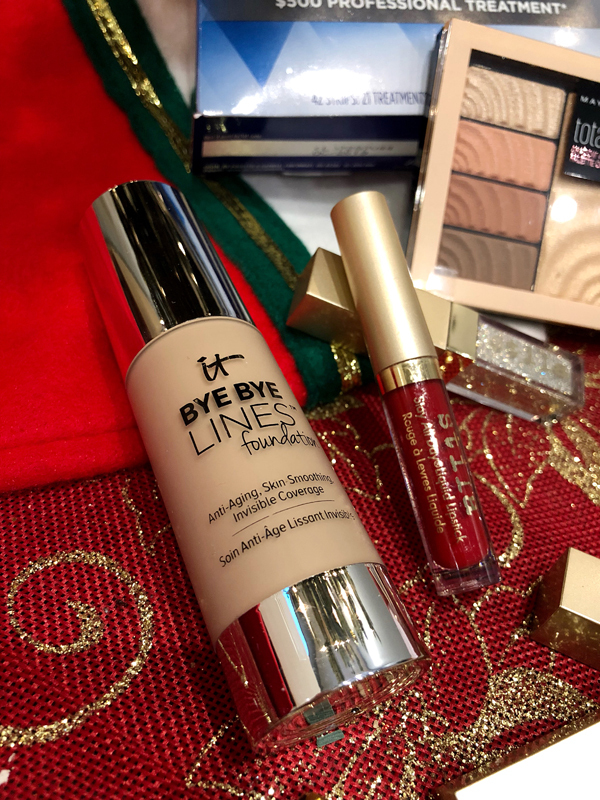 It Cosmetics Bye Bye Lines Foundation -Nobody wants to look cakey but everyone want a flawless finish for photos and Instagram snaps. Cue Bye Bye Lines Foundation, developed by plastic surgeonsas an anti-aging foundation. This advanced foundation contains anti-aging peptides, caviar extract, hydrolyzed collagen, hyaluronic acid, argan oil and babassu oil, plus vitamins A, C, E, B1, B2, B3, B5, B7, B9 and CoQ10 – and features proprietary Drops of Light Optical Blurring Technology for an airbrushed, lit-from-within glow. 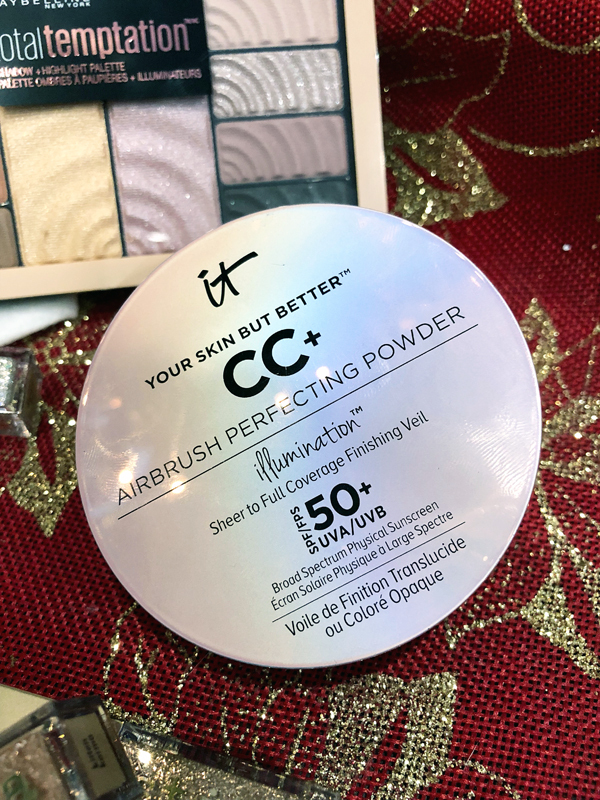 It Cosmetics Your Skin But Better CC+ Airbrush Perfecting Powder SPF50+ – Set your holiday makeup with this CC+ powder.Perfecting Powder is a revolutionary finishing powder that gives you the look and feel of your softest skin in 30 seconds. Made with proprietary Drops of Light Technology, this lightweight powder instantly transforms the look of your skin with a veil of optical-blurring pigments, and visually camouflages imperfections while providing powerful sun protection. Infused with hydrolyzed silk, hydrolyzed collagen, niacin and peptides, the talc-free formula also gives you completely buildable coverage that never settles into lines or pores.